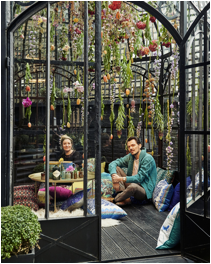 One more reason to start thinking about summer: Blakes Hotel Kensington has collaborated with British designer Matthew Williamson and installation artist Rebecca Louise Law to create The Hendrick’s Horticultural Oasis. Working together Blakes courtyard is reimagined as a sumptuous celebration of the summer season; resplendent in blooms and taxidermy inspired by the botanical infusions found in Hendrick’s Gin. Open from the 19th May – 14th July The Hendrick’s Horticultural Oasis at Blakes Hotel will play host to a bar of blooms and curiosities serving a range of cocktails created for guests as they relax in the luxurious surrounds of the garden. With fresh herbs grown in the garden forming part of the cocktails, including the invigorating Hendrick’s Gin Basil Smash with fresh lemon and basil, the libations will perfectly echo the spirit of the collaboration. 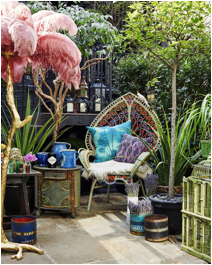 Matthew will transform the courtyard by incorporating his own brand textiles in collaboration with Osborne & Little and specially curated objet d’arts from one of his favourite interior design emporiums, Rockett St George to create a bohemian hideaway in the heart of London. Whilst Rebecca’s artwork will be in full display within the cabinet of curiosities in the Blakes birdcage; featuring a canopy of scented dried roses, peonies, hydrangeas, and Juniper berries. Rebecca says ‘I wanted to collaborate with Matthew to create a fully immersive experience of flowers and nature at every stage of a flower’s life.’ This in contrast with Matthew Williamson’s fresh and exotic prints will offer an immersive sensory experience.